Our fully interactive export ordering website means you can place your orders night and day. The website is linked with our nationwide network of warehouses and stock availability, range and latest pricing are shown in real time. Our online quotation system which you can track 24hrs means you get the best level of service. An array of features in the members area means you're never a click away from viewing all our latest products and services. 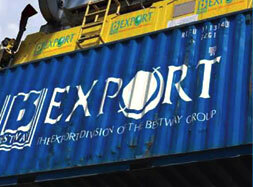 As professionals in export we know time is money, therefore the team at Bestway Export has made the whole experience as hassle free as possible. Whether you need goods at a port or at your door you can rest assured you are in safe hands. We make sure your consignment reaches you anywhere in the world. Our extensive portofolio of own label products consists of over 2,000 product lines, which range from western and ethnic foods to exclusive wines & spirits brands and pet foods. Whatever your market, we have a product for you. Wholesale export of grocery products – Bakery, Eggs, Milk & Cheese, Provisions, Frozen Food, Hot Beverages, Sugar, Preserves, Fruit & Desserts, Baking & Spices, Cooking Sauces & Mixes, Oil, Sauces & Condiments, Meat, Fish & Soup, Vegetables, Pulses, Pasta & Rice, Breakfast Cereals, Biscuits, Crisps, Snacks & Nuts, Confectionery, Soft Drinks, Beers, Wines, Spirits, Paper, Wrap & Foil, Disposables, Cleaning Sundries, Detergents & Cleaners.